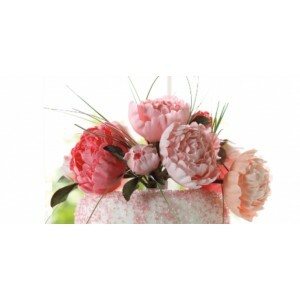 Peonies are relatively easy to make although require a lot of layers but the effort is well rewarded! The petal paste is shaded before the petals are attached to the peony to create the illusion of a dense mass of petals when in fact there are only approximately 7 - 8 layers. insert into the pink ball. Leave to dry. The petals are made in graduating sizes but the process for making is the same. or four more petals in the same way but allow then to remain slightly more apart on the top of the peony. Use the next size cutter and a slightly paler shade of pink for the next two layers and create 3 or 4 petals as before. When attaching layers, make sure there is space between the layers otherwise it may resemble the structure of a cabbage rather than the delicate frilled layers of a peony. To assist, leave the petals to dry slightly before attaching and leave to dry fully before applying subsequent layers. Make 2 further layers using the next sized cutter and a very slightly lighter shade of pink. Use the third largest cutter and create three or four petals as before. Allow to dry a little before applying and make sure there is a suitable space between this and the previous layer. former. Repeat making four (or more) wired petals. Using the florist tape cut to half width attach the wired petals to the peony. Tape the full length of the peony wire to neaten. Dust very lightly the tips of inner petals with the Fuchsia dusting powder. Add another layer if wished. Dust the back of the outer the outer petals lightly along the centre veining line using Moss green. Roll out some green sugar florist paste on the grooved board. Insert wires as for the petals and remove wired paste from groove. Cut out freehand oval shapes. All of the products are available from our cake decorating shop, Solihull, West Midlands or to order from our Sugarbliss Cake Decorating Shop.